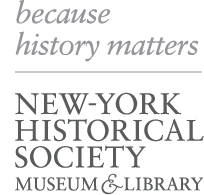 New-York Historical Society’s Homeschool Academy is designed to supplement your curriculum with engaging lessons in our classrooms, studios, and galleries. Students from ages 7–17 learn New York and American history from the early colonies through the 20th century through art-making and close-looking lessons, from Broadway musical hits, and by using their senses with objects from our touch collection. Classes visit the Museum galleries and exhibitions regularly. See below for descriptions about each series. Age groups are divided into three classes as described below. Students must be the age required for their specific class by the date of the first class. Each program includes five topic-based series, which fill the academic year, and each series comprises five weekly lessons. You can register your child for series individually or receive a discount for booking the full year. Tuition must be paid in full to reserve a spot in the class. To receive the discount for booking the full year, complete payment must be submitted before the academic year begins on September 21. Please complete our Homeschool Academy inquiry form for questions and to begin the registration process. Thank you! For questions and registration, contact homeschool@nyhistory.org or (212) 873-3400 ext. 264.